Destination is Südblock at Kottbusser Tor, Admiralstraße 1-2, 10999 Berlin. Come along all of you! UPDATE: We already got more than 2000 Euro! Thank you very much! Please keep supporting us. We appreciate any support. We fight for a world where nobody is excluded. In this fight we want to be as inclusive as possible. We are very happy that so many different people are organizing the „Mad and Disability Pride Parade“. This year deaf people are part of the team for the first time. Unfortunately we are not all able to speak German Sign Language. Therefore we found Sign Language interpreters who translate for us. Since the interpreters live from their work, we want to pay them. We organize the parade as an alliance without hierarchies. We are mad and disabled people as well as people who are not directly affected themselves. We are doing everything in our spare time, without getting paid. We don't want any money from the state or from organizations wanting to influence how we work. Therefore we kindly ask you for your support. One hour of Sign Language interpretation costs 50€. So by giving a donation of for example 25€, you help us speak and discuss for half an hour. Untill the parade we will meet approximately 25 times. Every meeting lasts for 2 to 3 hours, always needing two interpreters. Therefore in total we need 7.000€. 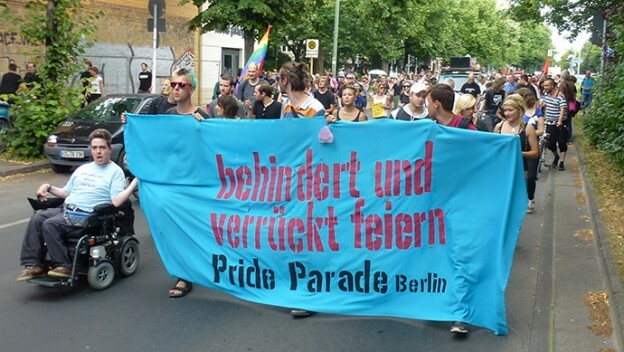 Read more about the Mad and Disability Pride Parade in the English language archive, or even more in German.